OK 152 was once signed as OK 41. 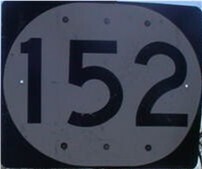 Sometime between 1953 and 1959, the highway was changed to OK 152 to coincide with the highway's number in Texas, TX 152. 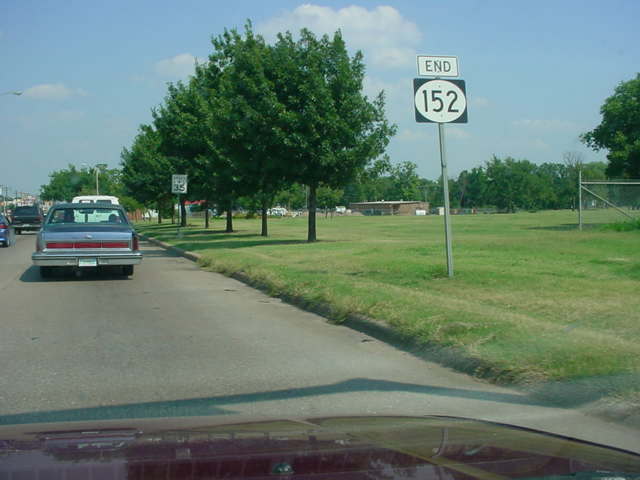 Until mid-April 2004, OK 152 ran along S.W. 74th St. to Council Rd., then went north on Council Rd. to Newcastle Rd., then went northeast on Newcastle Rd. to S.W. 29th St. 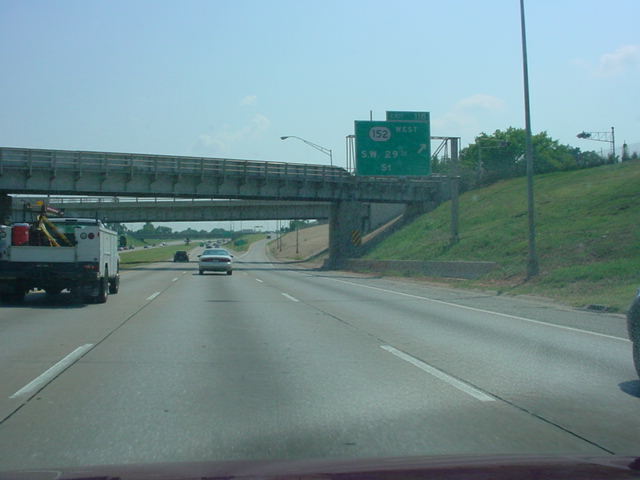 The highway ended at the Interstate 44 junction. OK 152 is now signed along Airport Rd., a 4-lane freeway in southwest Oklahoma City, and S.W. 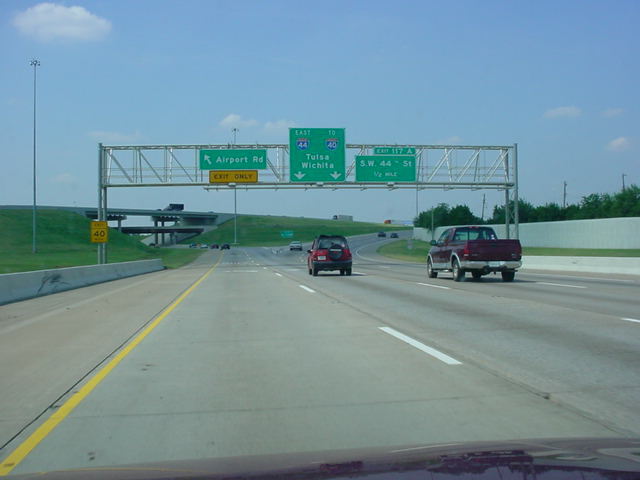 44th St., and the eastern terminus is now at Interstate 44 and Airport Rd., 1 1/2 miles south of the old eastern terminus. 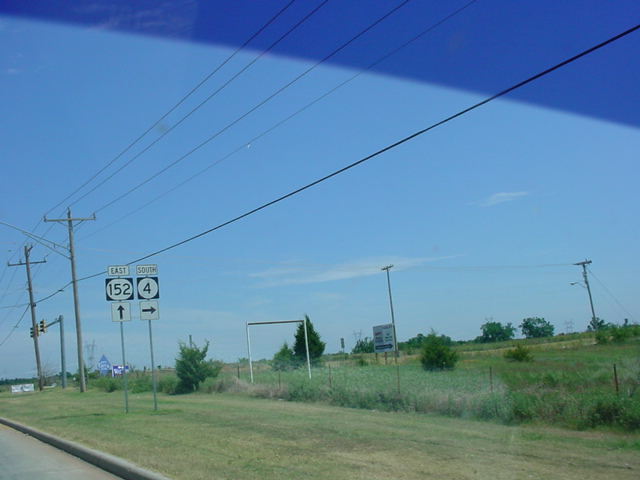 OK 152, the longest 3-digit state highway in Oklahoma, is an east-west highway running through the western half of the state. In western Oklahoma, the highway is known as the "Scenic Route of Western Oklahoma." Also, there are at least eight occasions where U.S. 152 is signed instead of OK 152! The highway itself begins in the Texas panhandle as TX 152 east of Pampa. Five miles after crossing the state line into Oklahoma, you enter the town of Sweetwater, where it intersects OK 30. It then intersects with OK 6 and OK 152 heads towards the southeast. It goes through Sayre, the county seat of Beckham County, and intersects U.S. 283 and Interstate 40. The highway doesn't see another town until Cordell, 36 miles east of Sayre. OK 152 then goes another 36 miles before its next town, Binger, where it joins U.S. 281 and OK 8 for five miles. 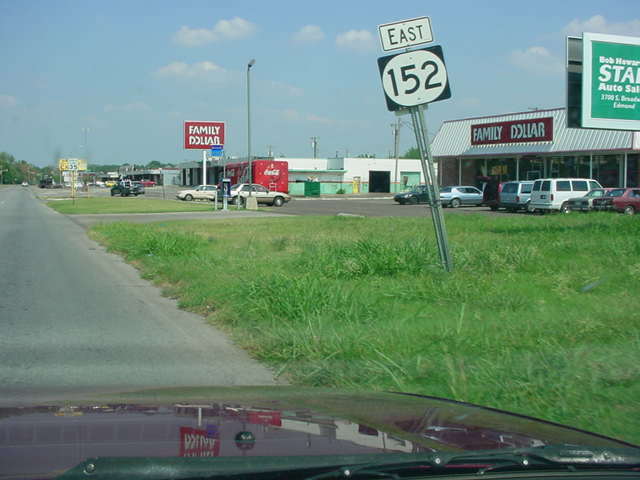 Nine miles east of the U.S. 281 and OK 152 split is the town of Cogar and the beginning of an 11-mile trek with OK 37. OK 37 and OK 152 then split at U.S. 81, as OK 152 heads to the north, crosses the South Canadian River, then heads east again in Union City. Then OK 152 heads its way into the Oklahoma City metro area when it enters the suburb of Mustang (pop. 13,156). The highway is the main route through the sprawling community and is 4 lanes with an extra left turn lane included throughout. 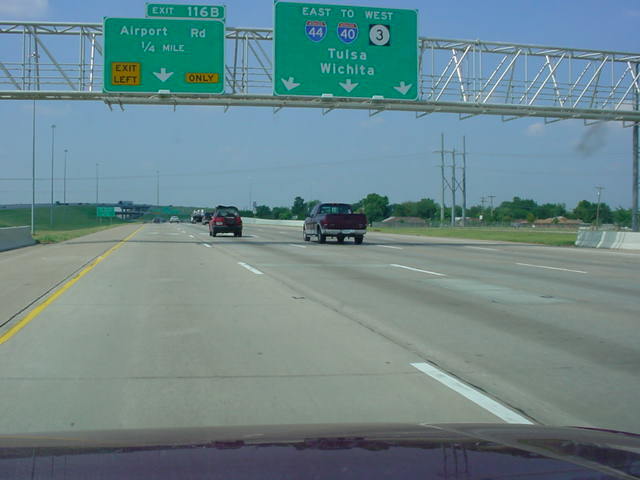 at least eight places where U.S. 152 is signed instead of OK 152. Oklahoma, this one is the Washita County courthouse in Cordell. years later, with all sorts of commercial development in the area. intersection in Mustang. OK 4 will depart on its own a mile later. Interstate 44 West at Exit 116B - OK 152 West - Airport Rd. sign was located just past the stoplight for Interstate 44 East. OK 152 East assurance shield just east of Portland Ave.
First OK 152 West assurance shield just west of Interstate 44.